In brief: What's at Vera Playa? 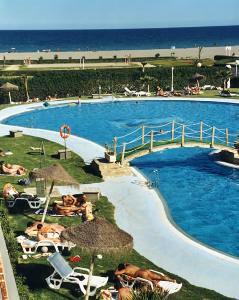 The principal facility at Vera Playa is its superb naturist beach. 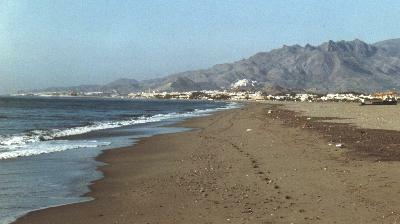 The beach stretches approximately 7 kilometres, from just south of Villaricos down through Vera Playa itself, and on to Puerto Rey and Garrucha. More than two kilometres is officially naturist. It is possible to walk along the shoreline all the way from Vera Playa to the attractive small harbour of Villaricos to the north or the larger fishing harbour and town of Garrucha to the south. The beach is predominantly sandy, though on the shoreline it can sometimes be pebbly - it changes with every tide. In fact the stones and pebbles on the shoreline are exceptionally diverse and attractive. The sea is swimmable all year (even in the depths of winter it is warmer than the seas in northern Europe in summer!). Less hardy souls, which probably includes most Spanish people who are acclimatised to Spanish weather conditions, would probably say that the sea is swimmable from about May to late October. At the height of summer (mid June until mid Sepember it is wonderfully warm. The Vera Playa Club hotel has a huge and beautiful outdoor unheated pool with waterslides and other water features and a small covered and heated pool. Vera Natura has a large outdoor unheated pool and a large indoor heated pool. Bahia de Vera has a substantial unheated outdoor pool and a large indoor solar and heat-pump heated pool. (La Menara now has an outdoor pool which is heated in the winter but its insulating cover has to be rolled back before it can be used so it is not available 24/7). All the pools are restricted to the clients/owners of the development concerned. 1. On the northern perimeter of the naturist zone: Outside the main entrance to the Vera Playa Club Hotel there is a parade of shops, bars and restaurants (this street is generally known as "Hotel Street"). The hotel itself has a large restaurant and several bars/cafes. Within the naturist zone there are some small cafe/bars and some beach bars/restaurants. On a public pedestrian way through the newest phase of the Natsun development there is the Paso Doble cafe/bar and next to the Vera Natura recption office there is the Bar Trinidad. On the beach in front of Natsun there is the Natsun Chiringuito (popularly known as Tiggers) and a little further south there is the Pirates chiringuito and on the edge of the beach close to Vera Natura there is a bar/cafe/restaurant which used to be known as the Sol y Luna but is now known as the Vera Natura beach bar/restaurant. Further afield: There is also a large selection of bars and restaurants in nearby places, such as Villaricos, Puerto Rey, Garrucha and Mojacar Playa (beach) and Mojacar Pueblo (village) and in the countryside and villages. Please note - the following table shows only some of the bars, cafes & restaurants. If you have information about any of the others please send it to us. (speciality is huge battered cod & chips at 8, but home made pies also excellent). Good value Sound system can be loud. Please note: 1. Spanish drink/drive limits are substantally stricter than the UK's so it is a good idea to walk to bars and restaurants or if you wish to go further afield either take a taxi/bus or in summer the little "land-train" or nominate one person to stay alcohol free and drive home at the end of the evening. 2. Small local bars/cafes can choose whether to allow smoking or not - most seem to have opted to continue to allow smoking. 3. There are somewhat more bars/cafes/restaurants than shown above - we will extend the list in due course - but the principal ones are listed. 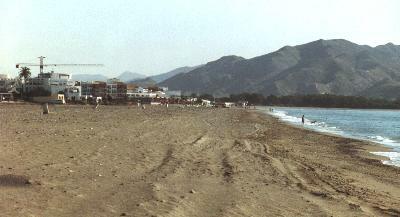 There are 3 chiringuitos (beach bars) as you go south from the main area of naturist beach (all textile) and an upmarket restaurant called B2 adjoining the beach at the Playa de Baria 2 urbanizacion (walking distance from naturist zone - about 1 - 1.5kms). If you have a car available Monika's Bar about 2.5 kms from the naturist zone on the road towards Palomares, offers excellent value meals with a menu del dia (around 11) in the evening which is unusual - but it is a smoking bar (there are tables otside which are fine in warm weather). 2. Prominently adjacent to the Garrucha to Vera road (4 kms from naturist zone - take Vera road from Puerto Rey roundabout next to Esquina del Rey commercial centre). Vera Natura Mini-Market To the left of the Vera Natura Reception office. This was the only supermarket where you could shop au naturel - but currently closed so that option does not currently exist. There is a reasonable size supermarket (Coviran) at the Esquina del Rey commercial centre at Puerto Rey and a medium size supermarket (Los Minutos) at Las Bougainvillas. 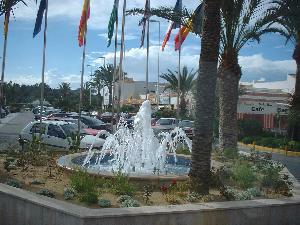 Vera has several large supermakets including Dia (near the roundabout with arch and fountains on the edge of Vera town), Mercadona (in the town) and Lidl (adjacent to the bus-station, easily accessible from the bypass). There was a large Intermarche supermarket near to the triumphal arch rounabout in Vera but this has recently closed down - we have heard a rumour that it will reopen as Consum but this is not yet confirmed (also a rumour that it has been bought by Carrefour?). Excellent street markets are held in Garrucha on Friday mornings, Vera on Saturday mornings and smaller ones in Palomares and Villaricos on Sunday mornings.